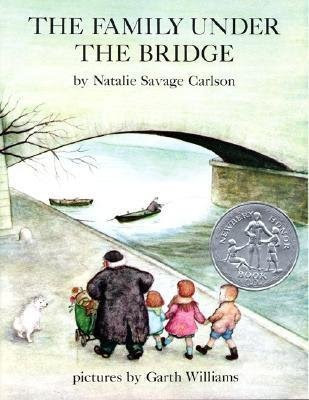 Written in 1958 and winner of the Newbery Honor, The Family Under the Bridge is the story of how an old hobo named Armand, who wants nothing of homes, responsibility and regular work, ends up with all of these as well as a family of children. Set in Paris, France in a time when hobos were more like wandering gypsies than the people living on the streets these days, the story follows Armand as he befriends the three young children, Suzy, Paul and Evelyne, their mother and Jojo, a shaggy dog that should have been white. Working all day at the laundry, Madame Calcet cannot watch her children and does not want them in school in case it is discovered that they are homeless. When she hides them in the niche that Armand usually occupies under a bridge that crosses the Seine, he is quite put out to have visitors in his camp. However, the children quickly convince him to allow them to tag along as he wanders the city by day. With Christmas approaching, Armand tells the children that he knows Father Christmas and will take them to see him. They spend a wonderful day walking to the Louvre, where Father Christmas, who is really Armand's friend, is working, then window shopping through the city streets where Armand has the idea to have the children sing for alms. When Madam Calcet learns that they have been begging, she is furious. In an effort to keep her from leaving the safe spot under the bridge, Armand packs up and leaves, much to the children's distress. When it begins to snow, Armand returns to the children and takes them to his friends in the gypsy camp with its caravans and tents. It is much to her distaste and a huge blow to her pride, but Madame Calcet relents and allows Armand to make a place for them in the camp. However, things go up and down from there and events finally take a turn that leads Armand to seek a job. The details of life in Paris make this an interesting book, as well as the descriptions of the gypsies and their lives. Garth Williams illustrations are smokey and grey, different from the line drawings in Charlotte's Web or those he did for Laura Ingall's Wilder's Little House Series. Yet, they are perfectly suited to the story and make it all the richer. I had forgotten about this one, but I remember being surprised at how fascinated my girls were listening to it. I hadn't had much hope for it, but they were mesmerized. I liked it too...so warm and exotic somehow. I had never read this one as a child (or to my own) and was really charmed by it as well! I definitely agree with your description of it as being exotic and warm! I remember this book, it's been forever since I have read it but I remember loving it. Thanks for sharing.